Screening at Kinoteka, the 8th Polish Film Festival at the Tricycle Theatre in London this year will be Bartek Konopka's Oscar-nominated documentary Rabbit à la Berlin. 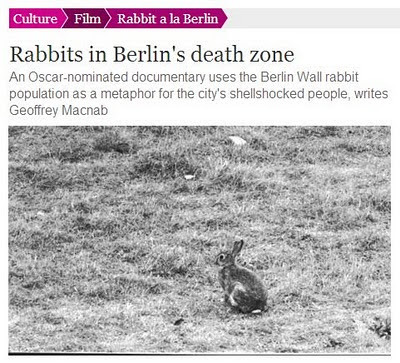 The film studies the after-effects of the fall of the Berlin Wall on the rabbit population that thrived in the no-go dead zone between the two halves of the city. The film uses their fate after the unification of Berlin to explore the challenges of living in the 'free world' that faced the citizens of Eastern Europe. The Guardian reviews the film here. It's had quite a lot of press over here. I think it's called "Krolik po Berlinsku" which is a pretty exct translation.